The items in this collection reflect the unique and rich history of the Town of Crawford and its environs. Our local history collection contains circulating and non-circulating items focused on the people and institutions of the Town of Crawford; as well as the surrounding area of Orange, Ulster and Dutchess Counties. Most of our materials can be borrowed through Inter-Library Loan. However, non-circulating items can be viewed at the library after an appointment with a staff member has been made in advance. Walk-ins are taken on a case basis. Please consult our access policy for more details. Pine Bush Public Library, Pine Bush, N.Y. [Postcard] (c. 1910). 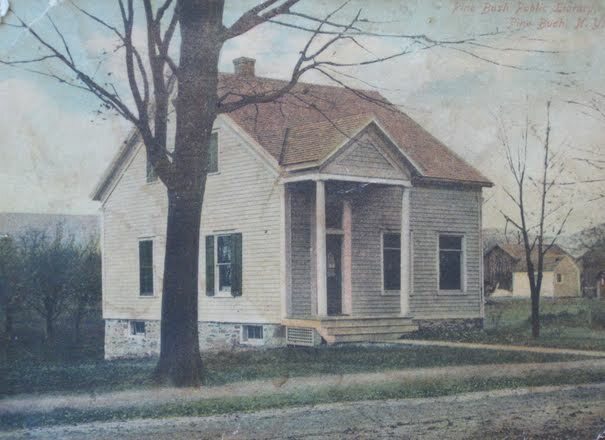 Pine Bush Library Historic Postcard Collection. Our non-circulating collections are open to students, teachers, researchers and the general public. In order to access these fragile and historic materials and prepare certain items for use, an appointment must be made at least 48 hours in advance by contacting library staff. Bags, pocketbooks and other bulkey items should be placed underneath the reading table at all times. Pens, markers and other permanent writing utensils are strictly prohibited; however number 2 pencils, tablets, laptops and notebooks are permitted for note-taking. Patrons under 18 years of age must be accompanied by an adult and food and drinks are strictly prohibited. Walk-in requests are taken on a case basis.